Real or cast? If only it were that simple! 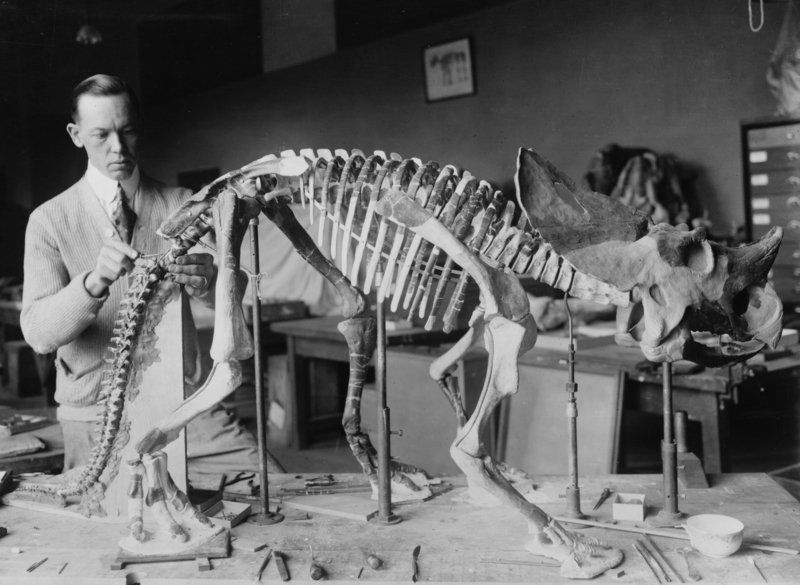 Norman Boss assembles a “Brachyceratops” mount. White bones and portions thereof are sculpted. Image courtesy of the Smithsonian Institution Archives. Back in January, London’s Natural History Museum incited a flurry of debate when it announced that Dippy, the Diplodocus skeleton that has graced the museum’s entrance hall for decades, will soon be retired and replaced with a blue whale. One of the recurring arguments in favor of the change has been that Dippy is not an original specimen – it’s a cast, or as some commentators have called it, “a fake.” As I argued last month, referring to a fossil cast in this way is a flagrant misrepresentation. An excellent post by Liz Martin covers this in more detail – “fake” implies deception, or something invented outright. Fossil casts are nothing of the sort. They are exact replicas of fossils, and they could not exist without the original specimens they are based on. Nevertheless, the idea that fossil mounts are either original bones or casts is a bit of a false dichotomy. I’m as guilty as anyone of propagating this myth – it’s a simple way to assuage the fears of museum visitors that the fossil skeletons on display aren’t real. The truth is that most mounts include some amount of straight-up sculpted material. After all, the fossilized remains of vertebrate animals, particularly large ones, are almost never found articulated or anywhere near complete. The specimens chosen for museum mounts are among the absolute best available, but even they are not perfect. For instance, the NHM Dippy (actually one of many) is mostly a cast of a single Diplodocus specimen held at the Carnegie Museum of Natural History, but the forelimbs were reconstructed. When the mount was assembled, no Diplodocus forelimb material of comparable size was available, so Arthur Coggeshall and colleagues sculpted some based on smaller specimens. 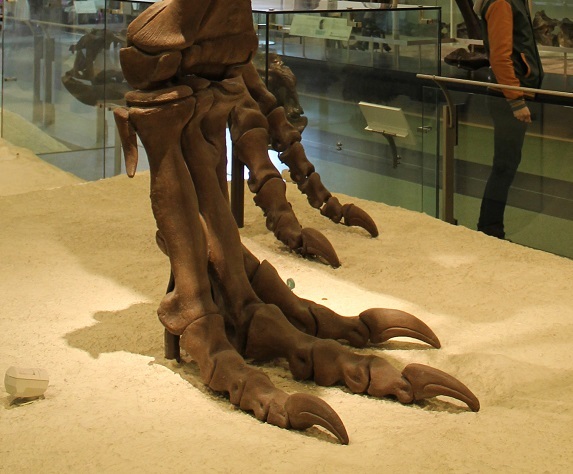 The sculpted feet of the AMNH Tyrannosaurus. Photo by the author. From Hadrosaurus, the first mounted dinosaur skeleton, to modern reconstructions like Anzu, fossil mounts as we know them would not be possible without some amount of informed reconstruction. Take the iconic Tyrannosaurus rex mount at the American Museum of Natural History, assembled in 1915. The skeleton is a composite of two T. rex specimens, neither of which included any of the bones of the feet. Rather than creating a skeleton that stopped short at the ankles, Adam Herman sculpted a set of feet based on Allosaurus, another large meat-eating dinosaur. When Tyrannosaurus feet were eventually discovered, the allosaur-inspired feet turned out to be a little too bulky – tyrannosaurs actually had relatively long, gracile toes. But it’s not like T. rex turned out to have hooves or wheels. In most respects, from the basic three-toed arrangement to the shape and position of each individual bone, Hermann’s hypothesized tyrannosaur feet were spot-on. In fact, they were so close that the museum didn’t bother updating them when the skeleton was remounted in 1995. Today comparative anatomy has reached such a point of perfection that, after inspecting a single bone, one can often determine the class, and sometimes even the genus of the animal to which it belonged…this is because the number, direction, and shape of the bones that compose each part of an animal’s body are always in a necessary relation to all the other parts, in such a way that – up to a point – one can infer the whole from any one of them and vice versa. Cuvier’s principle of the correlation of parts – the idea that all backboned animals are built on the same basic body plan – is fundamental to the science of paleontology. If we have the right forelimb of an animal, we know that it had a mirror-image left forelimb. If we find a skeleton with it’s skull missing, we can still be confident that it had a head. What’s more, specialists can often recognize the group an animal belongs to (and sometimes the species) from just a few bones or teeth. Salamander vertebrae have a characteristic hourglass shape. Frog limb bones have “double-barreled” cavities in cross section. Marsupial teeth have a stylar shelf. New world monkeys have an extra premolar in each quadrant of the mouth. With enough specialized knowledge of related taxa, it is entirely possible to produce an educated reconstruction of most any animal from a minority of its skeleton. But as far as mounted skeletons in museums go, how far can we take this? Is it reasonable to build a standing mount when only 50% of the skeleton is definitively known? What about 30%? 10%? By bone count, that’s about the percentage of fossils ever found from the sauropod Argentinosaurus. And yet, the Fernbank Museum in Atlanta has a (rather spectacular) Argentinosaurus mount in its lobby. The whole thing is, of course, a fiberglass sculpture, dutifully based on better-known relatives. This mount is probably a fair reconstruction of what a complete Argentinosaurus skeleton would look like (although see this list of inaccuracies at Paleoking), but some still might consider it misleading. Your mileage may vary. Museums generally do a good job labeling reconstructions. In particular, The Carnegie Museum and the Royal Ontario Museum are to be commended for posting charts alongside mounted skeletons that show which bones are original, which are casts, and which are reconstructions. In other cases, a little more transparency would not be unwelcome. For example, the four skulls below appear to include at least as much plaster reconstruction as bone, but they are all labeled as original specimens. Four heavily-reconstructed fossil skulls at AMNH. 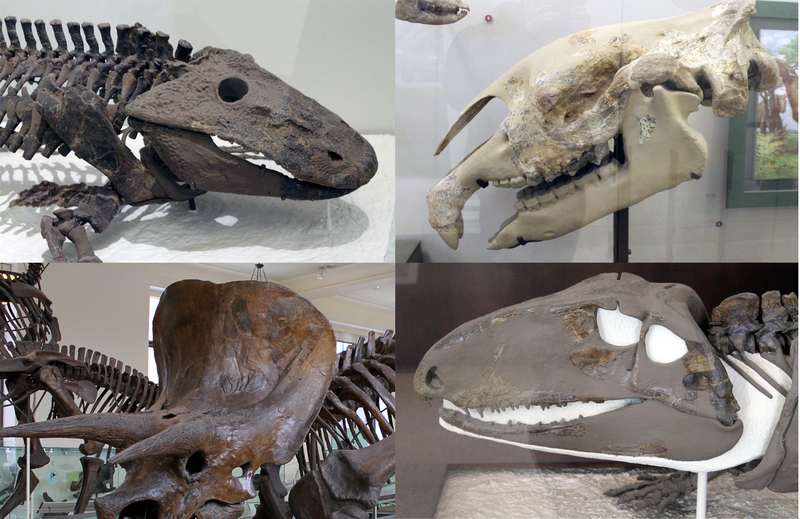 Clockwise from top: Eryops, Indricotherium, Ophiacodon, and Triceratops. Photos by the author. This is ultimately more of a philosophical question than a scientific one. Museum mounts, regardless of the amount of sculpted material, are usually well-supported reconstructions of the animal in question. If new information shows that a mount is wrong – as sometimes happens – staff are undoubtedly aware and will correct it as soon as funding and bureaucracy allow (granted, that can take decades). But as I’ve argued before, fossil mounts are unique among museum exhibits in that they are both the specimens and the interpretive context. They are hypotheses, but are presented (or at least understood) as straightforward truth. With this paradox in mind, how much is a museum ethically obligated to share about a mount’s creation? How can we do this without spurring visitors to use the dreaded f-word? Comments are open, as always, and I’d be thrilled to hear what readers think.